Fabulous Hair From the UK to the US! Founded over forty years ago in the United Kingdom, Batiste has lead the way in hair care. Their dry shampoo is #1 in the UK- it revitalizes hair leaving it feeling clean and smelling fresh therefore allowing your style to last longer between washes! In addition to having a wide range of scents in their Dry Shampoo collection (blush, cherry, tropical, fresh, wild and floral essences), they have now added a "Hint of Color". Batiste dry shampoos are a perfect addition to your hair care routine! You have a choice in selecting the scent you like and the possibility of covering greys while keeping your style last between washes! 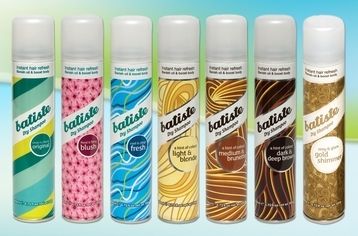 Find Batiste at your nearest beauty store for $8 Each!